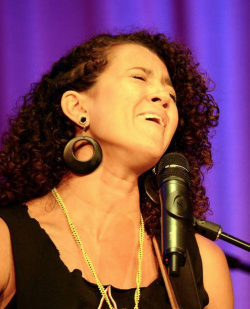 Native to Chicago, Maron Gaffron is a passionate and soulful singer-songwriter who we first played on UTR 4-years ago on Episode #183. She is making a comeback to the music scene, and likely to find some brand new fans along the way. The day this interview is posting (May 13) is release day on her first national album release in 9 years, and an album that she's been working on for 7 years, called The Holding Pattern. It's available now on iTunes - or wherever you purchase your music. It's full of rich spiritual lyrics, a soundscape of soul-jazz-blues-folk-rock, and a passionate voice similar to Alicia Keys' best moments. 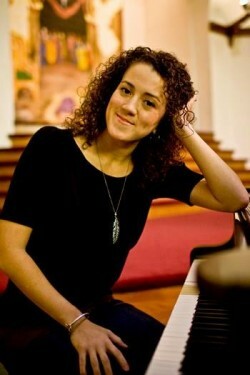 We had a chance to catch up with Maron and invite you into her amazing musical journey as an artist. UTR: How did you get started as a recording artist? MG: My dad's VS-880. He set me up with a microphone and a recording console in my bedroom when I was a teenager. That was my first time recording a solo project. After that, I moved to Jesus People USA when I was 18 years old. My friend Scott Knies took an interest in my music, and recorded some demos of my songs. Unbeknownst to me, he took those demos to the folks at Grrr Records. Shortly after that, Grrr Records came to me and asked me if I would cut an album for them. It took me about 2 years to say yes, but when I did the Uptown album was the end result. It was an incredible experience for me, recording in a real recording studio and working with studio musicians. Some of those musicians would become long time friends and collaborators. UTR: You had a noticeable absence from the music scene in recent years -- why did you decide to take a break. MG: We moved from the Jesus People USA community in Uptown, to the Southside of Chicago. For the past 7 years I have been working as janitor at my kids' school, to pay their tuition. I have put all of my focus and energy into making sure that my kids have the best childhood possible - which means, having a very involved mom. I've been mom, music teacher, coach, janitor, after-school tutor, pre-school teacher, teacher's aide, worship leader... the list goes on and on. It has been a busy 7 years! UTR: Now you are back with a brand new album -- what is the overall theme behind The Holding Pattern? MG: "There's no way of knowing which way the wind is blowing. I just pray You'll give me eyes to see." -- "His banner over me is love." -- There have been so many moments over the past 7 years where things have been uncertain. We've faced many changes and many challenges as a family. A constant prayer of mine was that God would give me clear guidance, both for myself and my husband. Sometimes we could clearly see the path, and felt confident that we were right where God wanted us to be. Other times were so stormy, so dark, we weren't sure we'd make it through. The Holding Pattern is a retrospective. It's how I realized that God held me in the palm of His hand the entire time. That there was no spiritual height that made me more deserving of His love, and no dark night that could ever separate me from His love. I've spent the greater part of the last 7 years jogging the 4 mile stretch around the airfield at Midway Airport. I can hear airplanes day and night as they land, and take off with a thunderous roar. In a way, I feel like I've been in a holding pattern of my own, waiting to land, circling the airfield again and again. That's an exhausting thought, until I shift my perspective. I'm not running in circles. I'm held and sustained by the loving hand of my Father in Heaven. As I continue to plow on in this busy life, His grace is sufficient. He will hold me. His banner over me is love. UTR: Is there one song from Holding Pattern that you are extra excited for the world to hear? MG: "God Knows Where" kind of sums up the entire theme of the album. It doesn't matter whether things are clear to me or not. God knows where He's taking me, because He knows where I've been. Therefore, let me run and never look back. Whatever affliction I may face in this life is "light and momentary" when compared to the glorious rest that is to come. It is indeed so sweet to trust in Jesus! UTR: What do you hope the listener of your music (live or recorded) walks away with? MG: A song in their head. I will oftentimes purposely incorporate scripture into my lyrics, so that I am forced to rehearse the actual Word of God over and over again. I am not shy about my scriptural plagiarism. When I was a kid, my dad was in a Christian metal band. He wrote loads of songs, but the ones that stick with me the most are the ones that are made up almost entirely of scripture. -- "The Lord is my light. Whom shall I fear? When evil men advance, they can not come near! Hark, do not fear. I will be confident. One thing I ask of the Lord, restoration upon repent. To live is Christ to die is gain." -- Try saying "hark" in a metal band! My dad didn't know it at the time, but he was drilling scripture deeper into my heart and mind each time he practiced those songs in the basement! I need the word, so I try to write that way. The best thing, is when I'm confronted with my own lyrics, and challenged to live according to the scriptures I sing. Am I really going to flip off this guy that just cut me off on I-55, or am I going to "do everything in love" ? Am I really going to trust that God knows where, or am I going to stay up all night trying to figure my whole life out in one night, and plan my future according to my own hubristic wisdom? I hope that these songs will stick with listener, like a little devotional in the back of their mind. And someday, when the time is just right, a song will come to mind that will challenge them, or encourage them, or remind them of God's character. God is love. UTR: Do have any music inspirations or musical heroes? MG: Doug Pinnick of King's X. I have to mention him first, because he is my vocal hero of heroes. I also grew up wanting to sing like Glenn Kaiser of Rez Band, and Matthew Ward of Second Chapter of Acts. I'm a big fan of the writing style of Rich Mullins, Steve Taylor, Carolyn Green, Erich Siemens, and Josh Garrels. Thanks Maron! 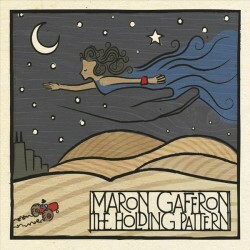 Run, don't walk, and pick up her newly released album The Holding Pattern and let the music (and Maron's amazing voice) sweep over you! Great interview! I’m looking forward to hearing the whole thing!